The proton pack sound board package is the ULTIMATE addition for making your pack come "alive". You can even integrate the sound package with our proton pack light board. The sound package includes a custom sound board with custom-made sound effects chip. Sound effects include: A pack powerup sound, a low frequency ambient humming sound, and a gun firing sound. The gun fire sound is played when you connect together the gun trigger wires, which can be connected to a trigger or pushbutton. All sounds are mixed together to provide a studio-quality sound system! NOTE: The package comes with all electronics tested and ready to be installed. You must install it into your pack. You can use any speakers with the package that you like. The bigger the speakers, the more sound will be projected. Mounting the speakers is also important to get optimal sound. If you want your pack to stand out in a crowd, then you can upgrade to the deluxe sound package!! The deluxe package includes everything in the standard package, but upgrades to a better, stronger amplifier and comes with high quality speakers ready to go! This package is for the ultimate collector who wants the very best! Make sure that the speakers included in the deluxe package will fit in your pack before installation! We can supply different sized speakers based on your pack's measurements. Contact us upon ordering and we can get the correctly-sized speakers for your setup! The deluxe package uses a small amplifier to give you some real punch! A sufficient power supply should consist of 8 D cell batteries, two 6V lantern batteries hooked up in series, or even a small 12V rechargeable lead-acid battery. The amplifier does require a high current battery supply in order to give you the best performance. The deluxe sound kit will also control a vibration motor that resides in your wand. The motor turns on automatically when the firing sound is triggered. This gives you the ultimate feedback synchronized with the sounds and lights of your pack. You can add your own motor to the circuit, or we also offer one. A new option for the economically minded. This new economy system doesn't have ALL the bells and whistles of the deluxe package but it still has all the great power and sound. Some of the features have been stripped away to reduce cost. The Economy Sound System can still be integrated with the Proton Gun light kit. The main difference is that there is no ability to play a variety of sounds by tapping a single button, nor can you control the wand motor directly. 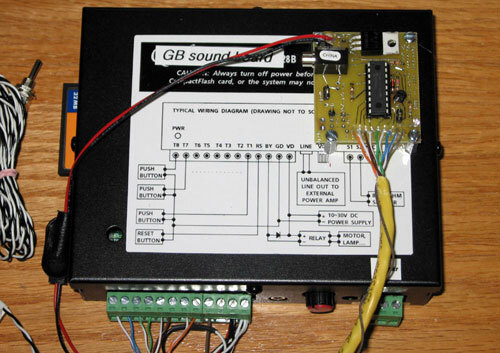 NOTE: The economy sound board is also used when adding sound to the integrated light/sound controller board! All the same features as the Economy Sound System but with added functionality for the automatic gun fire shut down sound and vent light power up sound. It also adds in direct control a vibrating wand motor (that is easily wired up). This package will come with the additional electronic components that you will need to assemble (soldering required) onto your own breadboard. Detailed wiring instructions are included.